Is it too good to be true? A snack that tastes like Thin Mints yet is high in protein and is totally portable — meaning that you can have it wherever you go and that it’ll fill you up and boost recovery after workouts? 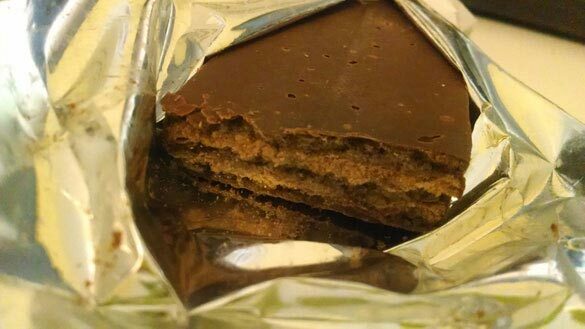 Okay, so in Erin’s review of the Power Crunch bars over on Fit Bottomed Mamas she says that these don’t taste exactly like Thin Mints. But, with 13 grams of protein, 5 grams of sugar, 1 gram of fiber and 205 calories for an entire bar, it’s certainly a better way to fix a craving when they strike! Or, you know, a better way to enjoy that chocolaty mint taste more often than just during Girl Scout Cookie season! Power Crunch bars are great — my favorite is the French vanilla. Usually I’m a chocolate person but the vanilla ones are really good.